When choosing a wheat for his 9600-hectare annual cereal program, Coorow grain grower Alastair Falconer is looking for a high-yielding, mid-maturing option that will tolerate late season heat stress conditions that often occur in his area and can significantly reduce yields. To help meet these challenges and reduce the risks associated with cropping in increasingly variable seasonal conditions, he sees a great fit for the new Australian Hard (AH) and Australian Premium White Noodle (APWN) variety, Devil. The variety is exceptionally high yielding, yielding similarly to Scepter. Devil was officially released by InterGrain Wheat Breeder, Dan Mullan at the West Midlands Group spring field day on Tuesday. Mr Falconer was keen to trial Devil as part of his wheat program this season and sowed a 16Ha trial in late May. He says it is looking fantastic so far, compared to nearby Westonia and Scepter crops, despite being sown at less than half the seeding rate of 65kg/ha used for those varieties. 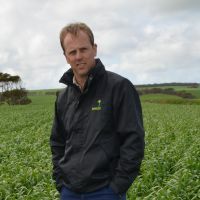 “It has established very well, showing a strong tillering capacity, good early vigour and is proving very competitive,” he says. Mr Falconer, who crops a total area of 16,000ha with his father David, uncle Ray and cousin Ian, says Devil is showing great potential for mid sowing opportunities and is likely to replace some plantings of Westonia, Ninja and Scepter in coming years. With the scale of the Falconer’s broadacre program, harvest logistics are very important. If APWN segregations are available this may be very useful in increasing delivery options. He says there is definitely value in the variety’s dual classification, as hard wheat had been difficult to produce in the past due to the higher protein specification and if he can deliver APWN and receive a small potential premium compared to APW1 then this will improve profitability. The Falconers also grow Ninja wheat for the udon noodle market and enjoy the premiums ANW often provides, for this reason he is keen to grow a new APWN variety to support the udon noodle market through delivery of the right noodle blends to Japanese and Korean markets. “Devil will also provide us with an alternative cereal option to help manage yellow spot and stripe rust in seasons where conditions are conducive to these diseases. “We tend to see the worst yellow spot in our wheat on wheat paddocks so MRMSp is very useful as yellow spot can be hard to control. 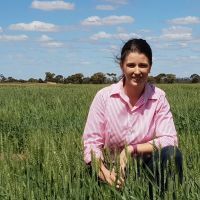 Dr Mullan says Devil is a very stable, early-mid maturing wheat, with exceptional yield potential, yielding similarly to Scepter based on the WA 2013-17 Long-term National Variety Trials (NVT) MET results. 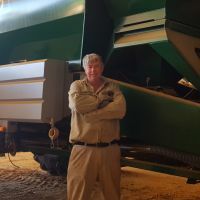 He says Devil has been extensively trialled for both yield and quality within the InterGrain program during the past four years and its broad adaptation and early-mid maturity provides growers with flexibility when sowing their wheat programs. “Having both an AH and APWN classification is highly advantageous in noodle growing areas if segregation and potential price premiums are available,” he says. “Devil also provides a robust disease resistance package, as it is rated MRp for stripe rust and MRMSp for yellow spot, an advantage for wheat-on-wheat rotations. “On the grain quality side, Devil has a great fit as it has an excellent grain size, lowering its tendency to produce screenings,” he said. Mr Falconer says it is pleasing to see InterGrain making continual breeding improvements in AH and APWN wheat varieties developed specifically for WA’s seasonal and environmental conditions. Devil is available for planting in 2019 and seed is available from local Seedclub members and/or resellers. Helping to ensure genetic gains thru breeding impact local growers. @w_tadesse out-standing in on farm demo plots of elite @ICARDA germplasm.